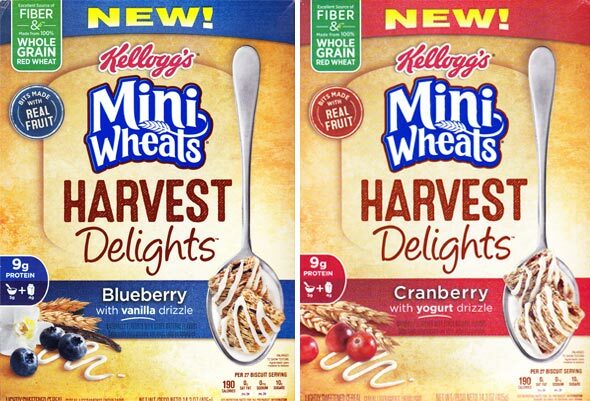 As of this writing in March 2016, Mini Wheats Harvest Delights came in two varieties: 1) Blueberry With Vanilla Drizzle; and 2) Cranberry With Yogurt Drizzle. I recently tried both and I'm happy to report that Harvest Delights are really quite delightful. Of the two varieties, I preferred the blueberry version. I've always been a fan of original Frosted Mini Wheats so I was excited to give these a try. They didn't disappoint. The bits of fruit interwoven within the strands of wheat in each biscuit are noticeable and distinctive. The drizzle toppings are an improvement over the sugar coating of most other Frosted Mini Wheats varieties. The drizzles feel more like frosting compared to the older cereals where their toppings feel more like simple crusted sugar. Blueberry was the first variety I tried. It had a terrific amount of authentic blueberry flavor in each bite. The bar was raised pretty high for my trial of the cranberry version. On first taste, the cranberry wasn't quite as flavorful and unique as the blueberry version. But by the end of the week - when I was out of blueberry - I found myself appreciating the cranberry version in a whole new way. I tend to think of cranberries like raisins. They're fine if you don't access to more exciting berries like blueberries. Cranberry Harvest Delights makes cranberries taste fun and interesting. It had me reconsidering why I group raisins and cranberries so closely together in my mental pantry. 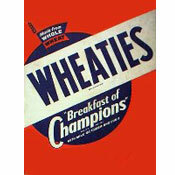 I really enjoyed these cereals. I recommend that you give them a try. 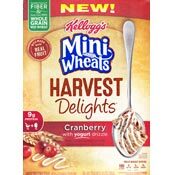 What do you think of Mini Wheats Harvest Delights?